Ahead of upcoming event risk, GBP prices have and are likely to continue to hold the range highs. Parliamentary developments ahead of next Tuesday’s “meaningful” vote will continue to dominate the domestic focus through today’s session, as we go into the third day of debates on the EU withdrawal agreement in the House of Commons. On a broader perspective, a key risk to our bullish GBP view is that Brexit clarifications are dragged out - even beyond 30 March if Article 50 is extended, and the GBP appreciation consequently will be much more moderate and materialise later than our forecast (main scenario) implies. Defeat of a Brexit motion in parliament causes the government to fall, paving wave for a general election and/or a second referendum and potentially no Brexit. 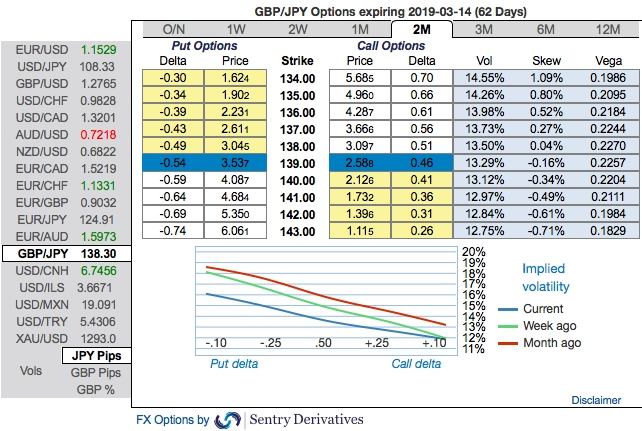 OTC outlook and Hedging Strategy: Please be noted that IVs of this pair that display the highest number among entire G10 FX universe (spiking above 13.52%). Hence, vega long put are most likely to perform decently capitalizing on rising mode of IVs. While the positively skewed IVs of 2m tenors signify the hedgers’ interests to bid OTM put strikes upto 134 levels (refer above nutshells evidencing IV skews). Accordingly, diagonalput ratio back spreads (PRBS)are advocated on the hedging grounds. Both the speculators and hedgers who are interested in bearish risks are advised to capitalize on current abrupt and momentary price rallies and bidding theta shorts in short run, on the flip side, 2m skews to optimally utilize delta longs. The execution: Capitalizing on any minor upswings , we advocate shorting 2w (1%) OTM put option (position seems good even if the underlying spot goes either sideways or spikes mildly), simultaneously, go long in 2 lots of long in 2m ATM -0.49 vega put options. The rationale for PRBS: Well, the traders tend to perceive these trades as a bear strategy, because it deploys more puts. But actually, it is a volatility strategy. Hence, entering the position when implied volatility is high and anticipating for the inevitable adjustment is a wise thing, regardless of the direction of price movement. Based on volatility and time decay, the strategy is a “price neutral” approach to options, and one that makes a lot of sense. Currency Strength Index: FxWirePro's hourly GBP spot index is flashing -28 (which is mildly bearish), while hourly JPY spot index was at -17 (mildly bearish) while articulating (at 10:26 GMT).